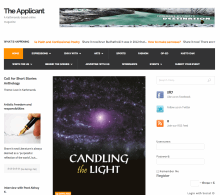 The Applicant, founded in 2011, is the first Kathmandu-based English online Journal of Literature & Arts. The Applicant is dedicated to publish poetry, short stories, essays, reviews, photography and art. The Applicant is a global journal, however, prefers to promote Nepalese writers writing in English and works that are linked with Nepal and which bears Asian tone. RArticle Article Up to 2,000 words.